Last week I asked a heavily loaded question: Do you have a choir at your church? The use of choirs in the worship service, especially in bodies like the United Reformed Churches in North America, tends to be a controversial subject, so that question was actually pregnant with another one: Should you have a choir at your church? To help set the issue in context, I brought Revs. Idzerd Van Dellen and Martin Monsma into the discussion with their 1967 work The Revised Church Order Commentary. Their insight explained the traditional and well-founded aversion to church choirs in the Reformed heritage, but we left off with little practical advice. Today I’d like to wrap up this discussion with some more down-to-earth ideas for the average United Reformed congregation. Rather than seek our strength in choirs and in special numbers of all kinds, let us continue to appreciate and emphasize worthy and vigorous congregational singing. To some extent, the relationship between the choir and the congregation is an “either-or” proposition. The authors ably demonstrate that the choir was one of the chief factors, if not the chief factor, in silencing the singing of the congregation in the medieval Roman Catholic Church. At the time this commentary was written, Van Dellen and Monsma noted that “many churches all around us have excellent choirs and soloists, but congregational singing in these very churches is often extremely weak.” And it’s not hard to draw a parallel between the ostentatious church choirs of the mid-1900s and the blaring praise bands of the present day. In decisions such as that made by the Synod of 1926, the Christian Reformed Church expressed strong reservations about the use of choirs in worship, rightly noticing a definite inverse relationship: Where choirs sing, the congregation becomes silent. Choirs easily sing songs which are inferior or unsound doctrinally, because the music or sentiment of certain songs appeal. Neither should it be forgotten that good solo and choir singing easily becomes an attraction at church services. Some singers are tempted to exhibit. And some church-goers go not so much to worship and to listen to the message of God’s Word, but to hear good singing. The singing by experts occupies the center of their interest. Furthermore, churches in their attempt to secure good choirs are often tempted to let unworthy persons sing in their choir. Many employ paid singers. But even if the commercial element is avoided the primary requisite with many is not true spirituality, but rather a good voice, ability to sing well. Church choirs have often been a source of trouble and grief. Petty jealousies and unworthy ambitions are factors which have made for ill-will again and again. Taking all of these concerns into account, I think the regulative principle of worship and historic Reformed practice make a compelling case for the complete exclusion of choirs from our worship services, at least as an art form. But before you disband your loyal group of singers in dismay, let me try to reframe this conclusion in practical terms. The highest form of musical praise the church can offer is through corporate singing. What a beautiful sound and sight when the entire congregation sings together with joy and vigor! This kind of music, Van Dellen and Monsma note, keeps the Word of God at the center of the worship services (if the psalms are sung, as they should be!) and serves as a wonderful united expression of praise. “[I]n the church,” they say, “we believe it is best for the whole church to sing. Strangers who may happen to visit our services often express their appreciation of the fact that we have splendid congregational singing, that all, young and old, sing at our church services.” The psalms contain plenty of individual exhortations to lift one’s voice to the Lord, but their commands to the congregation are also unequivocal: “Make a joyful noise to the Lord, all the earth!” (Psalm 100:1). Give me a group of however many hundred men, women, and children singing with joy to the Lord over any little group of trained singers—any day, any time. The choir is a teaching choir, not a performing choir. The purpose of the choir ought to be to instruct its members in the habits of good singing and musical literacy. This is not a group primarily for performance in the worship service or elsewhere, although putting on special programs is not out of the question. The choir is to consist only of members of the congregation. This should simply make sense if the purpose of the choir is clear as explained above. The introduction of paid singers would be proof that the choir’s mission had changed. And the director of the choir absolutely must understand and uphold the key principles of Reformed worship as well. The choir should learn only what will be helpful in inculcating better congregational singing. I hesitate to exclude all complex anthems or oratorios, but as far as corporate worship goes, they are at best irrelevant and at worst distracting. A small teaching choir can’t go wrong with a repertoire built mainly on simple four-part psalm and hymn arrangements. The choir should sing in the worship service as the exception rather than the rule. This is tricky territory; I would highly prefer having the choir sing only on special occasions rather than in a Sunday worship service. However, this decision must take into account the needs and expectations of each individual congregation. The choir is nothing more than a slice of the congregation. It would be ideal, of course, if every member of the church would join the choir as a kind of “Singing 101” class. At the very least, however, the members of the choir will hopefully develop an appreciation and love for the psalms and hymns of Reformed worship. Then they merely have to carry that renewed enthusiasm back to the pews with them on Sunday morning. If they do, the choir has fulfilled its mission. I would welcome your additions or corrections to this list, but I submit to you that the points above set forth a justifiable and properly-regulated domain for the church choir which is in keeping with the standards of Biblical, Reformed worship. They are not foolproof, but at least they are fall protection. All this does not mean that we should not bring our congregational singing to higher levels. We should improve our singing whenever possible. 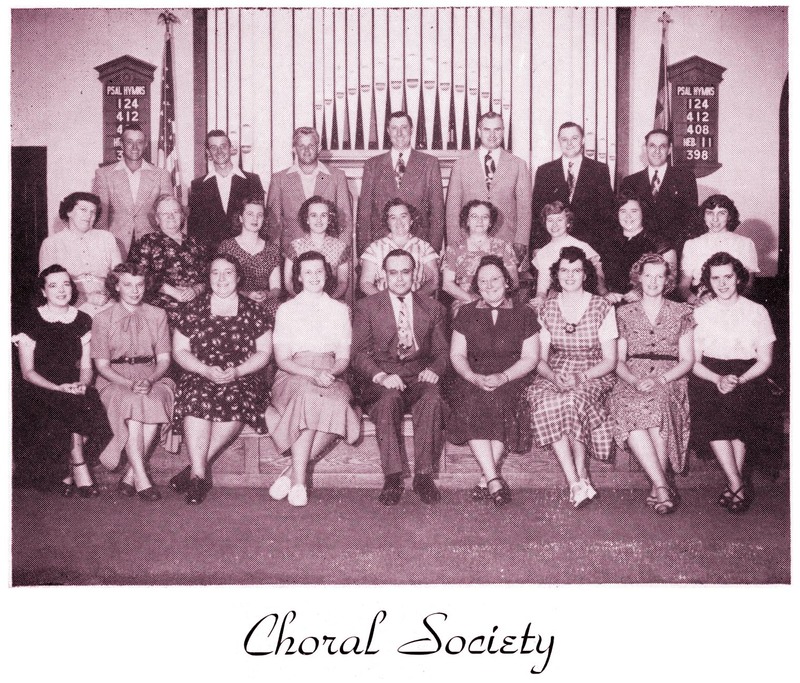 The organization of Choral Societies should be encouraged. Good singing should be promoted. But let us continue to emphasize and to improve congregational singing. And let our good singers help to improve our congregational singing. The excerpts quoted here are from The Revised Church Order Commentary by Idzerd Van Dellen and Martin Monsma, Grand Rapids: Zondervan, 1969 (third printing), pp. 205, 206. Do you have a choir at your church? The primary objection to the use of a choir in the worship service is that it tends to violate the dialogical principle which guides our Reformed worship services. The principle is simple: God speaks, we respond. There are only two parties in the equation—the Lord, who speaks to us through the ministry of the Word and sacraments, and the congregation, which offers up songs, prayers, and gifts in thankful reply. In this system it is difficult, though not necessarily impossible, to justify the existence of a choir in a corporate worship service. Assessing the ecclesiological implications of choirs in worship is far above my capabilities at this point, and the fact that so many learned men have been unable to reach an agreement on the topic shows that it can’t be resolved simply. But I would like to approach the question from a slightly different and more practical perspective, one taken by the authors of the excellent volume The Revised Church Order Commentary. Revs. Idzerd Van Dellen and Martin Monsma undertook the writing of this commentary on the Church Order of the Christian Reformed Church (CRC) in 1941 to help explain to ministers, elders, and interested laypersons the proper functioning of this group of churches. The Revised Church Order Commentary was published in 1967 to coincide with the extensive revision of the CRC’s Church Order in 1965. And since the Church Order of the United Reformed Churches in North America is completely silent regarding choirs, this resource is probably one of the best and most applicable to which we can turn. a. The consistory shall regulate the worship services. b. The consistory shall see to it that the synodically-approved Bible versions, liturgical forms, and songs are used, and that the principles and elements of the order of worship approved by synod are observed. c. The consistory shall see to it that if choirs or others sing in the worship services, they observe the synodical regulations governing the content of the hymns and anthems sung. What points of application does this article make as to the use of choirs? First of all, Van Dellen and Monsma point out that “the very wording of the provision under consideration, as may be noticed, is simply permissive…And if [choirs] do [sing], then the consistories shall see to it that the pertinent synodical regulations are adhered to.” In other words, the Christian Reformed Church did not forbid the existence of choirs in worship, but it did provide a guard and limit on their use. The authors of the Commentary note that Article 52 also allows soloists and small groups to “render special song numbers in the worship services,” provided the same restrictions are applied. 1. The danger exists that congregational singing shall be curtailed. 2. If the choir sings separately there is the difficulty of maintaining the principle of Article 69 of the Church Order [which states that only the psalms and the synodically-approved hymns, i. e. the contents of the Psalter Hymnal, may be sung in worship]. In cases where choirs exist or shall be introduced, synod insists that only those psalms or hymns shall be sung which are approved by Article 69 of our Church Order; or such anthems, which contain only the exact words of portions of Scripture. To many of us here in the URCNA, these synodical restrictions may sound unduly harsh. Why such concern over what a choir sings? Does its repertoire really need to be limited to the Psalter Hymnal or excerpts from Scripture? Doesn’t its music ultimately help the congregation as we together lift our hearts in praise to the Lord? Van Dellen and Monsma give two principal consequences of the use of choirs and soloists which the Christian Reformed Church feared. First, many of these musical offerings are of the type which simply “do not fit in the framework of our worship services and which do not edify the worshipers.” What percentage of these selections might be prepared with no thought at all given to the dialogical principle of worship mentioned above? Even though we would recoil in horror from saying it out loud, too often our soloists tend to become performers and our choirs tend to give concerts. Suddenly the dialogue between God and his people is broken, even unintentionally, by the awkward intrusion of a third party—an awkwardness that is exemplified in the uncertain smattering of quickly-smothered applause from the pews at the end of the “performance.” Should we really be faced with this situation on a regular basis in corporate worship? 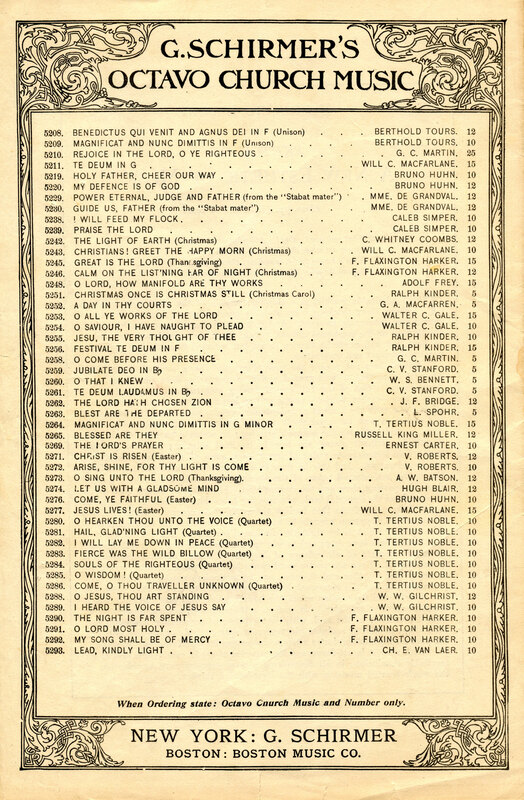 Second, the authors simply call our attention to the fact that “these extra and special numbers are very hard to control as to their doctrinal soundness.” It is a strange phenomenon, but a true one, that an unsound song is much more likely to be sung first by a soloist or choir than by the congregation. It is, as Van Dellen and Monsma admit, an area in which Scriptural accuracy is much more difficult to regulate than in simple congregational singing. What is the solution to the perennial problem of the church choir? Can this tricky element of worship be effectively redeemed, or ought it to be eliminated entirely? Although I don’t have a simple answer to the question, in the second half of this article I’ll try to explore some practical ideas that can help individuals and congregations reach a conclusion. The excerpts quoted here are from The Revised Church Order Commentary by Idzerd Van Dellen and Martin Monsma, Grand Rapids: Zondervan, 1969 (third printing), pp. 205, 206. See also The Church Order of the United Reformed Churches in North America. Today’s post on church music resources is both a recommendation and a request for your input. The resource in question is a set of paperback volumes of Psalter Hymnal arrangements by Dale Grotenhuis. I’ll back up a little bit to explain. Recently I spent a few hours making an inventory of all the papers, booklets, volumes, folders, drawers, boxes, shelves, cabinets, and rooms of choir music at my church (West Sayville Reformed Bible Church). The sheer amount of sheet music, from the early 1900s to the present day, is staggering—and, if you’re trying to get organized, overwhelming. 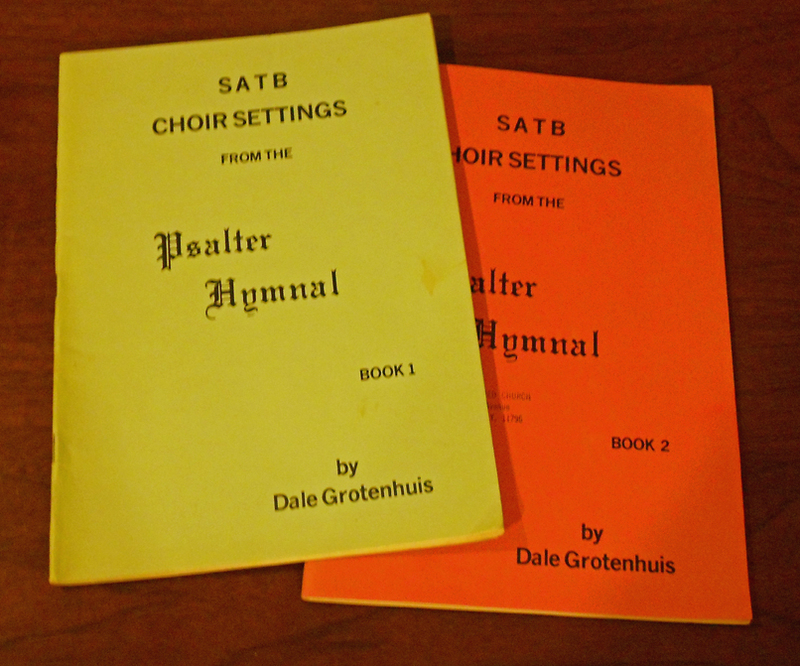 But in the bottom of one of the boxes, I found an orange booklet from 1979 which read, “SATB Choir Settings from the Psalter Hymnal, Book 2, by Dale Grotenhuis.” What a find! I already own the recordings of these arrangements on a CD set, “Be Thou Exalted, LORD,” from Dordt College. But since we’ve just started up a church choir again for the first time in decades, having the sheet music at hand was a tremendous plus. These arrangements are perfect for Sunday services—easy enough to learn, reverent enough for worship, and familiar enough for the congregation to recognize and appreciate. I was even more excited to find about twenty more copies of this orange booklet in the back of one of the cabinets. After I mentioned this discovery to one of our organists, she offered me another volume of Psalter Hymnal choir settings (volume 1, with a blue cover). Unfortunately, however, I haven’t found any more of these volumes at church, so I am currently trying to learn how I can obtain more. From some of my research, it seems that there are more volumes in this set—possibly as many as four. There is no indication that the booklets were officially published by the CRC, nor is there any contact information inside the cover for author or publisher. A quick search on Amazon.com only turns up a copy of Book Three, which it helpfully adds is “currently unavailable.” As far as I know, Dale Grotenhuis is now retired, but continues to be a member of a URC in Michigan. Does anyone know if his arrangements are still available, and if so, how they can be obtained? Your help in this effort would be very much appreciated! Even if you’re hearing about these arrangements for the first time, you might want to check your church’s music library or storage room. If you have access to copies of these booklets, you’ll be amazed at the quality of these settings and their versatility as solos, offertories, choir pieces, and so on. As I perused the contents, it struck me that these are some of the best arrangements for simple, wholehearted praise to God through music. I’m so thankful for the work of musicians like Dale Grotenhuis.